Although my décor is normally very neutral in color, during the holiday's I decided to add a pop of red to the décor. I added hand painted pillows trimmed with red and crème ticking fabric to add a festive feel to the bedding. You can obviously see which side of the bed is mine!! I'm finally finished decorating for Christmas!!! From the Ponds to your home, here is a tour of our porches this year! We had a little snow over the weekend to add to the festive feel around here. I don't know if you can see it in this photo, but I just had to share with you. I just wanted to share this morning a little of our journey while renovating the place we call home "The Ponds". You may wonder what motivates us to keep adding on to this property. Since we began this journey, we've built a pier with a gazebo, developed an outdoor kitchen area, built a stage, built our home, and most recently added a pool. Just our porch alone can accommodate 25 - 30 people. So why have we done this? Because there's nothing we love more than to be surrounded by our family and friends. I have never understood people who have lovely homes and never share them with others. We are so motivated to create a space where everyone that we cherish in our lives, can come and enjoy each other. I'm taking you on a tour of our property and some of the things we've done to create a space that other's can enjoy. This is a recent pic of the house & pool! We began our journey 10 years ago and I've shared some of the before photo's and stories in previous posts. One of the things we did right from the beginning was create an outdoor kitchen area. As we were planning our farmhouse, one item on our wish list was an outdoor shower. When we are in the middle of projects here at the Ponds, we can get pretty dirty. We have previously been known to use a hose to shower off before going inside. So an outdoor shower sounded like heaven to us. We decided to have the plumbing ran for the shower while the plumbers were here during the construction phase of our home. However, we decided that we wanted to build the shower ourselves. So we moved in with just a shower head outside of the house. Needless to say we didn't use it at all last fall. This past spring we started the planning of our shower. Note: We have an outdoor shower at the beach which we also love. The shower at the beach is small and has a door. Since we are not real professional builder's we decided to design a shower without a door. However, we wanted privacy while showering. The solution was a privacy wall within the shower. It has been so convenient to just walk right in. We used treated lumber and started with a deck style platform built low to the ground. We used concrete deck blocks to support the 4x4 posts and buried them level with the ground. This helped to keep the platform level. We spaced the boards with a small gap, so the water could drain to the ground. We used 4x4 treated posts for each corner of the structure and one in between the longest wall. We used 7 4x4 posts total. Then we used 2/4's to attached them together. One at the top, middle and bottom. We left the bottom board about 8 inches off the floor. We had custom metal sheeting cut to size for the walls. The whole process only took my husband and I two days to complete. The one thing I highly recommend is making sure that the posts and floor is level. We would attach and then check to be sure everything was still level. Then repeat. I'm sorry that I don't have pictures of the process. We get so caught up in our projects that we forget to stop and take picture. The structure is very simple and hopefully you can see the details in the finished product. How to use faux flowers successfully. I like nothing better than real flowers. This is my time of year with all the fresh blooms and buds. With that being said, it can be really hard and expensive to have fresh flowers around your home year round. What I like to do is use as many fresh and real stems as possible but incorporate faux stems into the mix. I don't mix together in the same arrangement, but in separate containers. I feel that when you mix it up, it's hard to tell which are the real deal and which are fake. Here are a few area's that I've mixed. See if you can tell the real from the faux. Here I have a mix of lavender, magnolia, tulips and button bush. Unless you are making an up close inspection, you really can't tell the tulips are faux. As we were drawing the plans for our forever home, we made a list of priorities that each of felt we couldn't live without. (I'll go into more of the list at another time.) However, high on my husbands list was a TV, entertainment room. Since we were not planning a basement, his solution was a loft. I was resistant to this idea because of the wasted space. Finally he convinced me that a barn like feel would be just what we needed. So we settled on the idea of a loft area. We made sure the area was large enough for our leather sectional sofa and we also decided to add a 1/2 bath for convenience. My priority quickly moved to making sure the railings had an industrial feel. So we opted for custom steel railings, painted black. I love how amazing this faux shiplap looks. When I ran across this nesting box, I decided I wanted to use it in my little mini-shop to display the farmhouse wares that I had been working on. I knew it would require some rearranging and I felt that shiplap walls would be just the ticket. The thought of cutting the wood and installing was daunting in itself. Not to mention to cost. So I did a little more research and found that some very creative ladies had just taped off the lines and painted with black paint. A much more cost effective choice. As I was getting all my trusty tools together, I realized that I would need a pretty massive amount of painter's tape. This stuff isn't cheap either. Keep in mind that this space is a rental and I would be covering over a lot of the walls with this nesting box and other items for sale. Then I thought, why not just draw the lines on with a sharpie marker. I decided I'd just give it a try in a non conspicuous space. I was amazed at how great it looks. As you've noticed, if you've read any of my blog, I have the real deal in my home. There are no perfect lines in real shiplap. Some spaces between the boards are wider and some more narrow. There is a lot of imperfection and a lot of character. So it was easy to create faux lines with a marker and if I made a mistake, that is just the charm of shiplap. To see all the instructions on how easy and cheap this technique is, go to my page DIY projects. We love the outdoor life, especially eating outdoors! 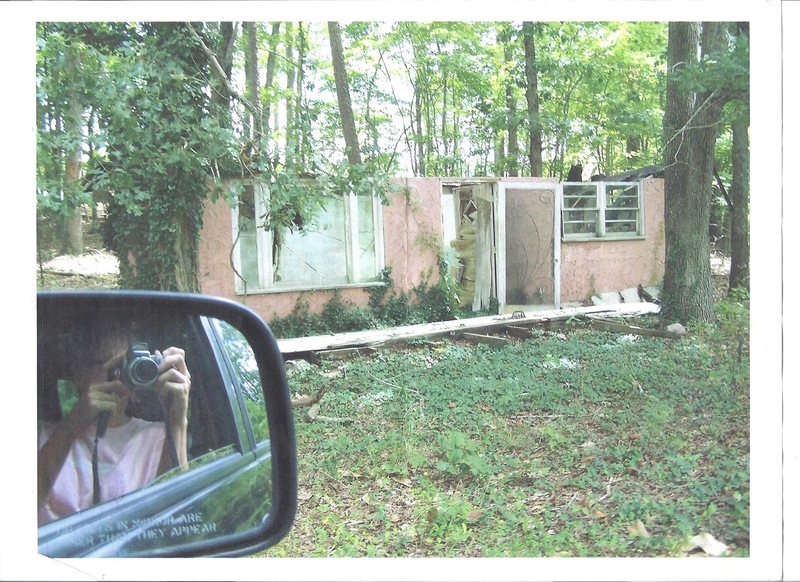 We love the view from the original cabin on the property, but the cabin was in such bad shape when we got the property, we considered tearing it down. The roof had fallen down and the windows were broken out. The cost to replace these items was more than the structure was worth. As we began to clean up, we came up with an idea to save the old cinder block cabin. We chose to remove the majority of the front and add a pergola cover for the top. This was going to become our outdoor kitchen. My husband loves to grill and experiment with all types of outdoor cooking! Which I love, because I don't want to cook. We love to entertain and decided this would make a great area for our friends to gather. Here are a couple shots of the area before any cleanup. I'll admit to a little "old" farmhouse envy! When my husband and I began making plans to marry, we also began looking at old houses to buy and renovate. One such house was a beautiful 2 story white farmhouse with a wrap around porch. It had a gorgeous site with large oak trees. It was perfect. However, it came with 100 acres of land. Today it would be a steal, but at that time, we just couldn't afford it. We also looked at a primitive farmhouse that would need to be moved to a new location. For a young couple, only 20 and 22 at the time, these fixer uppers started to seem daunting. So long story short, we did the traditional thing and built a small little house on a small lot in a neighborhood. Time went on and we moved into a larger home and then we built our then dream house just over 20 years ago. We had never given up the idea of that old house so we used a few antique pieces in the construction. Once again, the cost factor and fear made us cautious about using to much of a good thing. My dad was a farmer and had several acres of pasture land. 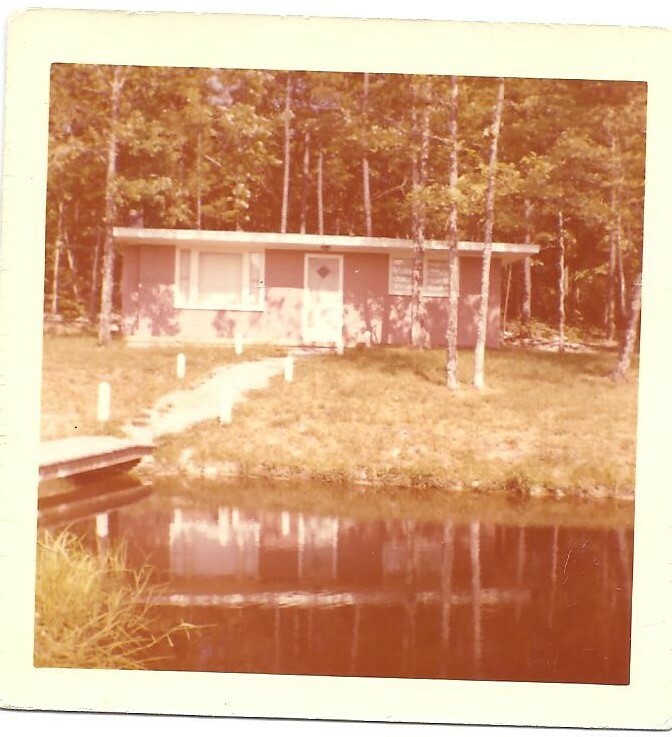 Before I was born he had built 3 beautiful ponds with a small cabin and it was a beautiful site. My husband and I had always loved this spot, never dreaming that one day it would be ours. Once it was, we spent over 8 years working on the property to bring it back to it's former glory. What the cabin looked like as we began to clean up the property. 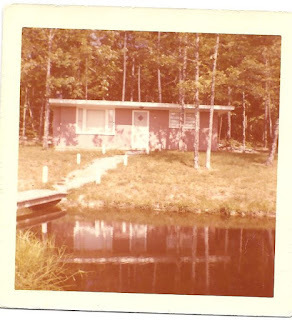 We then decided to downsize and move to the country. My dream would have been to have an old farmhouse to fix up. I dream of old hardwood flooring, old shiplap walls, everything old and authentic. However, that was not to be. So we decided to build a new - old farmhouse. We were fortunate to have a contractor who was willing to install old doors, light fixtures, etc. When we started construction, we actually had a hard time finding SHIPLAP! Don't these people watch Fixer Upper? Now that construction is complete, I see shiplap at Lowes. Just wanted to make a quick post of this adorable door. It was saved from a beautiful old farmhouse that was built in the 1800's. It was being destroyed and a friend of mine just happened to get there in time to rescue a few of the doors. When he found out that I was in love with old doors and would actually use them, he generously gave them to me. You should have seen my happy dance. I installed 3 of these beautiful heavy wood doors in my farmhouse. This little beauty is only 5 ft. high but I was determined to find a place for it. It had been painted white many moons ago and as I was cleaning the grime away, the paint started to go with it. Only a little of the white remains but I consider everything about this door a work of art. Zoom in to check out the door knob. It's an old wooden thread spool. In order to maintain as much of the original appearance of this door as possible, I put a clear wax over the wood. I'll feature my other doors at a later date. If you have any COMMENTS OR questions, PLEASE DO NOT LEAVE A COMMENT ON THIS BLOG. Please connect with me through Instagram and I'll be happy to reply. I have been so caught up with my new house, that I've failed to post anything about my clothing designs. I get really excited when a plan comes together and today's plan is finished. I love layers and feel more comfortable spending my money on items that I can wear multiple ways. So with that in mind, here is my latest creation. Last week I decided to browse a few websites to see what was trending in fashion and home décor. I ran across a really lovely throw from anthropologie that would be perfect for my bedroom. The price tag ($98.00) was more than I wanted to pay so I wondered if I could make one myself. I came up with a plan and here is the finished throw. I love how it matches my décor perfectly. Here's how I accomplished making this lovely throw for less than $15.00. I purchased a drop cloth from Walmart paint department then washed and dried. The result was a very soft fabric. I then cut to size (50x70) and hemmed the raw edges with a top stitch on my sewing machine. I then went to my trusty Silhouette Cameo and created two different stencils and proceeded to cut the stencils on a reusable stencil material. I had three colors of Annie Sloan Chalk Paint that would work great for my bedroom décor. (note: I'm not including the cost of the paint as I already had the paint left over from previous projects and it only took a tiny amount of each to stencil the whole project) I started by stenciling the long edges of the throw and then began in the middle, working out in both directions to fill in the pattern. I tried to keep the lines straight by measuring between each stencil as I went across. Once I was finished with the stenciling and it was dry, I added handmade pompoms to the short edges. I used grey yarn that I had purchased for a previous project. The yarn was purchased from Hobby Lobby using my 40% off coupon so I paid approx. $3.00 for the yarn. I used a bangle bracelet to wrap the yarn to create the pompoms. Then I used a heavy duty thread to hand stitch them to the throw. Here is the $98.00 throw. The colors are beautiful, but the more muted shade works better in my room. Here is my handmade throw on my bed. I was so inspired by the solemn look on this mama cows face. I had to stop and take a photo. She just watched me with those soulful eyes. I had been wanting to add something over my table and just couldn't find anything that I felt was perfect. I wanted to incorporate the verse from John 1:16, Grace upon Grace. I love how she turned out. Weird how I amaze myself all the time. This is my first blog post and I have no idea what I'm doing or where this is going to end up. But here goes. I apologize in advance if this doesn't look professional. I love finding trash that I can turn into a treasured item. Imagine my surprise when I discovered these beauties! You have to realize that I'm currently obsessed with anything galvanized. I'm washing these tin cans and preparing them for the recycle bin, when I realized they actually look really good! I'm sure I could upcycle them for some crazy use. I loved the color and realized I wouldn't need to paint them. I just filled them with some boxwood cuttings and surprise, surprise! I placed them in my window over my farmhouse sink. I'm really in love with this look. I couldn't get a good photo at the window, but they look pretty good on my island as well.